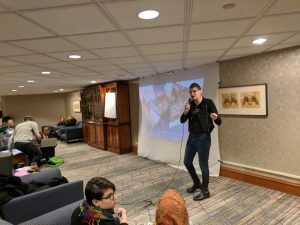 Jan 26 – Queer activists attending the Creating Change conference flocked to a guerrilla session on pinkwashing, Palestine, and the influx of right-wing pro-Israel funding into US queer politics. The workshop had been banned by Creating Change and its parent organization, the National LGBTQ Task Force, outraging activists. 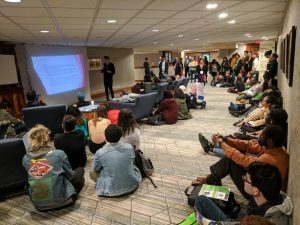 By the start of the conference, more than 560 people had written letters to the Task Force calling on them to “end the blackout on Palestine” and stop silencing queer anti-apartheid activists, and more than a dozen organizations had signed on to the call. by marketing Israel, primarily to white men, as a gay haven. Pinkwashing has extended in the US into LGBT pro-Israel groups funded by right-wing and Trump funders to exert influence on queer politics from within. Presenters pointed out that the main pinkwashing group in the US, called A Wider Bridge, receives no funding from LGBTQ communities. The conversation was quiet and focused, despite the presence of a stafferfrom A Wider Bridge draped in an Israeli flag photographing speakers and presentation materials. The second guerrilla session is tomorrow, Saturday Jan 27 at 9am.